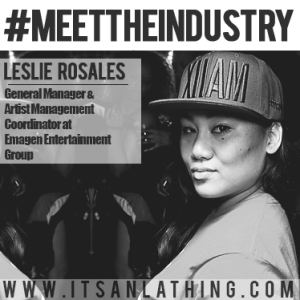 Meet the Industry: Leslie Rosales – A Filipino from South Central, who happens to have a cool job. Check out my interview with ItsAnLAThing.com in their #MeettheIndustry segment. I’m humbled to be recognized…. Thank you to Jocelyn Vega for highlighting positive women in the industry, doing positive things. Love! It was all a DREAM. . . Given that Nas is my favorite rapper and that I follow him on Instagram, I stumbled upon one of his managers; Leslie Rosales. I was captivated by her for a few reasons; one being that she’s so well-respected in the music industry. The second being that she has a heart of gold. In addition to being a part of the team that manages multiple artists, she also gives back to the community. Leslie, along with other great souls, are attempting to end world hunger with their #HashtagLunchbag non-profit organization. Continue reading to learn more about the South Central, Los Angeles native. How did your journey into the entertainment/music industry start? I see u Les…95th Normandie South Central L.A. we Love u…dew ur Stuff 2 da Fullest…..100!!! Congrats I’m proud of you leslie. Somebody made it off 95th street and Normandie. This is you’re old neighbor from across the street Rashid. God bless you and your fam. Peace out. Ps come visit my church I am a Gospel Preacher now and married with 3 kids.